About – Hello Again, Dolly! 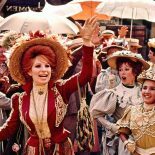 2018 marks the 50th Anniversary of the filming of Hello, Dolly! in the communities of Garrison, Cold Spring, West Point, Peekskill, and Poughkeepsie. This 3 time Academy Award winning film is an exuberant Valentine to the Hudson Valley, and life along the river during the final golden days of the19th century. In the movie, Victorian “Yonkers” was recreated by filming in multiple locales along the river from Ossining up to the Hudson Highlands and Poughkeepsie. To celebrate the Dolly Anniversary, the Dolly Returns Committee is organizing a six month season of educational events and celebrations starting Spring of 2018. Many local nonprofits, including Putnam History Museum, Desmond Fish Library, Garrison Art Center, Depot Theater, Hudson Valley Shakespeare, Cold Spring Lions, and Philipstown Parks and Recreation have come together to help make this happen. This is our Community Festival and all proceeds benefit arts and educations projects of our local community nonprofit partners. NEED A PLACE TO STAY? ?